Anybody out there proud of their abs? Can any of you even see your abs? I'm pretty sure I've got some, but they're underneath a layer of fat that's been there for as long as I can remember. So what do they look like? That's the question I've been asking myself for a long time. I've been doing crunches and sit-ups for years but an oft-repeated quote keeps coming back to me, that is: 'good abs are made in the kitchen'. Ok, so a quick look around my kitchen reveals a lot of simple, refined carbs. For those of you who don't know what I'm talking about, that means bread! White bread, white rice and pasta. To put it simply, simple carbs provide the body with quick energy, but most people these days eat too much of them, (cuz they tend to taste pretty darn good) and the body stores the excess as fat. What some people are saying now is this: Humans evolved from a diet of mostly protein (meat, eggs) and complex carbs such as vegetables. There was no bread, pasta or grain in our diet and various people have started to point to evidence that our early ancestors were healthier than us. Is it true? It sounds reasonable but I don't really know. However, there is one way to find out! Become a caveman! Back to Mike's labratory. Whoops, due to the amount of leftover bready food in my apartment, I've decided to start my diet tomorrow (Tuesday) so as not cause waste. Fear not, I'm not giving up already, and no, this isn't some lame excuse and I'm not procrastinating. See ya tomorrow! Tuesday June 13th, Day 1: Current weight: 74kg/163lbs. Well I made it through the first day, but whoa, I had no idea cavemen had it so tough! With junkfood and bread products so rampant throughout the modern world you don't realize how much your body really craves them until you take them away. Felt slightly lightheaded and curiously empty during the day. My workout at the gym was a bit tough, my stomach felt like a black hole and it was hard to concentrate. I spent the whole day thinking of food and had to eat four times just to feel satisfied! As for my menu today, yes I know, cavemen most likely didn't drink milk, and surely not cheese but I left them both in my diet in small quantities because I didn't want my body to have zero energy. Any caveman would've done the same given a chance. Breakfast: Milkshake - banana, egg, small glass of lowfat milk, blueberries, plus some nuts and prunes. Lunch: Salad - lettuce, spinach, tomato, carrot, parsley, cheese, can of tuna with olive oil/spice dressing. Dinner 1: Pork with grilled vegetables, raw cabbage (restaurant), plus some grapefruit, melon and pineapple for dessert. Dinner 2: Omelette - 2 eggs, onion, tomatoes, bacon, parsley, cheese, plus some cherries for dessert. My body sure ain't getting used to having no bread products. Feeling hollow and kind of weak again today, a bit worrying perhaps? However, there is a feeling of accomplishing something new, which I like. It's amazing really, eating large portions of vegetables and meat and the hollow empty feeling doesn't go away! At least not for a couple of hours. This is due to the fact that simple carbs are digested quickly, but protein, fat, and complex carbs take longer. It's a bit easier now for me to envision what life must have been like for a hunter/gatherer. It seems like a romantic lifestyle when reading about it, but the reality is that humans probably spent 90% of their waking hours looking for food just to survive, and were always hungry. Dreamt of curry at CoCo Ichibanya while sitting on the train home. Forgot my book which made it even worse but my inner caveman resisted the urge. Breakfast: Same as yesterday minus the egg. Lunch: Medium chicken breast cooked with some spices (cavemen might not've had spices, but I figured they're not really detrimental to my diet), eggplant, onion, spinach, parsley. I must have passed some milestone. The feeling of constant starvation was quite a bit less today, as well, I could concentrate more and didn't feel so weak or lightheaded. Of course the hunger pangs weren't gone completely, just that it was more of an annoyance than a constant aggravation. Breakfast: Same as usual, plus egg today. Lunch: Beef slices cooked with mushroom and spices, plus boiled squash. Snack: Half a grapefruit and an orange. Dinner:Salad - lettuce, spinach, parsley, carrot, tomato, green pepper, 2 eggs and bacon with olive oil/spice dressing. Lunch: Squid fried with asparagus, carrot and onion and some spices, some cherries for dessert (it's cherry season now). Dinner 1: Kind of a chicken/vegetable soup, I didn't drink the soup though, just the contents (restaurant). Dinner 2: Some pork fried with spinach, green pepper and parsley, plus some boiled squash. Honeydew melon for dessert. Lunch: Salad again, with tuna this time. Dinner: Lots of grilled meat and vegetables at a yakiniku restaurant. Eating only veggies and meat can obviously be boring. Besides salads and using my frying pan their isn't much else to do with them, or is there? Well I couldn't think of anything, but when I asked Kumi she pondered a minute, then suddenly suggested making spaghetti, but using thinly sliced cooked cabbage instead of noodles! 'Yes', I thought, 'It just might work!' The result? Delicious! And so the day was saved. Thanks Kumi! Lunch: Tuna and sausage with tomato sauce, mushrooms, carrot, parsley, and eggplant. Used cabbage instead of noodles. Delicious! Dinner: Steak cooked with mushrooms and onions (also delicious), with a bunch of cherry tomatoes. Snack: Banana and some raisins. Well here I am, finally at the halfway point. Seriously feels like I've been doing this forever and there's still forever to go. Lots of support from family, friends and students, which is nice. Just wanted to reiterate that I haven't cheated even once, chalk it up to my superhuman willpower. Some reduction progress made in the stomach area, just hope it continues for the final photo next week! Breakfast: Same as usual. (No I never get tired of the same breakfast, still love blending up bananas, blueberries, eggs and milk. Also, prunes and walnuts are a great combo). Lunch: Salad again (the usual veggies), with tuna. Dinner 1: Some porklets fried with cabbage, mushrooms, and eggplant. Dinner 2: Some fried eggs, bacon and tomatoes, a grapefruit for dessert. No matter how long I diet, it seems the cravings for junkfood will never go away. Is this how it is for smokers trying to quit? Or alcoholics? Even if they're successful do they have to face the urge not to every single day from then on? If it's true then I have new respect for people who manage it. Wish I'd never heard of or tasted junkfood, maybe ignorance really is bliss. Lunch: Sausage, tuna, eggplant, onion with cabbage instead of noodle spaghetti again, yum. Dinner: Steak cooked with mushrooms and onions. Snack: An orange, some melon and some raisins. Lunch: Squid and chicken stirfry with chinese cabbage, broccoli, eggplant, and carrots. Dinner: Salad again, (the usual veggies) with chicken. There are two types of people, those who live to eat and those who eat to live. I now realize that I'm definitely of the former group. To make up for the lost pleasure of snacking on things like chocolate, ice cream, donuts, etc., I've resorted to eating a variety of fruit in an effort to help control my wild cravings. However those who live in Japan know that fruit doesn't come cheap, especially exotic things like mangos, cherries and melons. Not only that, but fruit just isn't filling. When faced with a small 1000 yen melon or a tiny 600 yen pack of cherries (about $10 and $6 dollars respectively), junkfood can look pretty tempting. Breakfast: Same as yesterday of course. Lunch: Salad, the usual vegetables plus bacon and tuna. Dinner: porklets with various grilled vegetables, carrots, eggplant, onion, lotus root and asparagus, with a cabbage salad (restaurant). Snack: A mango, some cherries, some prunes, walnuts, and a banana, starving! Geez, losing weight is a lot harder than it looks! 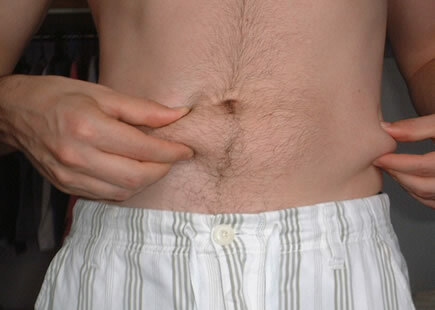 The ring of fat around my stomach has decreased a little bit, but not enough and it's too slow! What's it take huh? Lunch: Salad (again!) with tuna (again!). Dinner: Pork tenderloin with mushrooms, eggplant and broccoli. Today was tough. Kumi and I went to this place in Tokyo called Odaiba, which is like a giant shopping/entertainment area. There's even a mini beach (although dirty) and a nice park. Anyway everywhere you look there are ice cream stands and snack bars selling all kinds of unhealthy (but delicious looking) crap. As we walked around, I had to endure the wonderful smells of non-caveman food everywhere, the worst was when we walked by a Cinnabon shop. Dinner was a challenge like last weekend. We didn't feel like yakiniku again, so we settled on this Chinese restaurant and had a bunch of stir-fry like dishes without any rice. Pretty good! Lunch: Omelette with sausage, mushroom and goya! Dinner: Lots of meat/vegetable dishes at a Chinese restaurant. Snack: Melon and dried mango. Almost finished my two week period! Another hard day to get through though. After ultimate today had to put up with some pressure to just forget the (stupid, as some people called it) diet and come eat at some Mexican restaurant. Fortunately the day was saved by one of the frisbee guys named Hank who is something of a health food nut. He, British Mike (who was curious to try this health food phenomenon) and I headed to a supermarket and picked up a bunch of items (see below), cut and mixed them all up, then ate it at some outdoor open patio. It was surprisingly good! British Mike however wasn't satisfied and later went to McDonalds. Breakfast: Sausage, mushroom and goya omelette again, plus the usual blueberry/banana milkshake. Dinner: Lots of melon, some avocado, then tofu, plain yoghurt, walnuts, raisins, apple, banana all mixed together. GOAL! Monday June 26th, day 14th: Current weight: 71kg/156lbs. Well I made it! I endured 2 weeks of aggravation, hunger and boredom all in the hope of losing enough fat to expose my ab muscles. The result? Unfortunately the abs are still kinda hard to see, I guess two weeks isn't long enough. Kinda disapointed there, but I did lose 3 kilograms or 7 pounds which is a lot! A bit scary actually, but good to know that this diet works. All that aside though, I do feel a lot better, energetic and healthier now than before. So now what? I think having no bread at all for the rest of my life is a bit harsh, so I'll bring it back in small quantities and try to limit myself to brown bread and rice. In the meantime I'll keep working on my abs. Stay posted for a shot of my six pack sometime in the future. Breakfast: Just the usual milkshake, nuts and fruit. Lunch: Small hamburger steak, an avocado and some tomatoes. Dinner 1: Sautéd chicken with eggplant and goya. Dinner 2: Bunch of meat and veggie dishes at a Japanese restaurant. 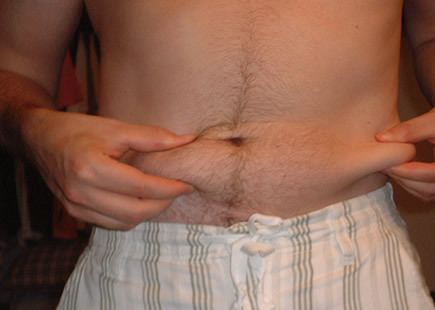 Here's my stomach 14 days post dieting. As you can see, even though my abs are not showing yet, there is a definite reduction of waistline and fat quantity.